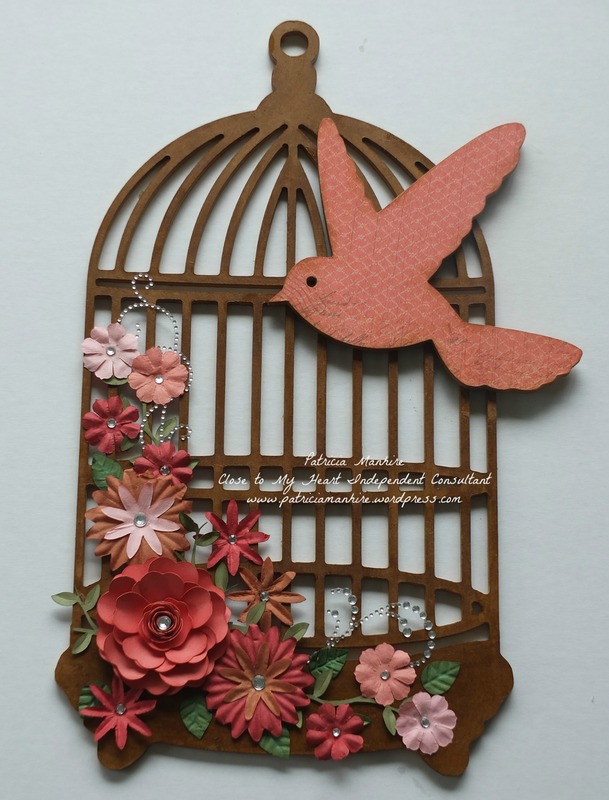 Home › Patricia's Creative Corner › Out of the Box with CTMH and Kaisercraft. Out of the Box with CTMH and Kaisercraft. I hope you all had a good Christmas. I had a lovely relaxing day and I am now getting back into crafting. I normally use only CTMH products but the local Spotlight store had a special on Kaisercraft wood kitsets so I bought a few to have a play with. Apart from the kitset and mod podge everything else I have used in these projects is CTMH. 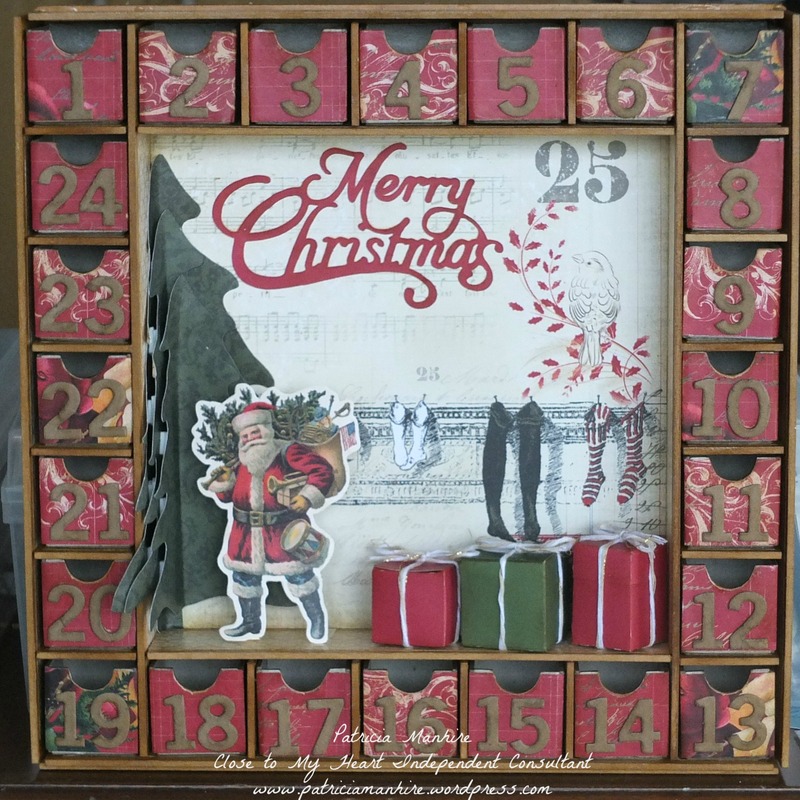 I love the CTMH papers and the Yuletide Carol papers are just gorgeous and I felt fitted well with this advent calendar. I have tried to create a picture of a living room with the stockings hung by the tree and the parcels waiting to be opened. I have sponged all the edges with Desert Sand ink and I love how the wood has turned into an antique gold colour. I have cut out the centre from the patterned paper and lined it up so that it would be the centre of the box. I used the red patterned paper to line the boxes (there are a number of You Tube videos that show you how) and after sponging the edges with Desert Sand ink I modpodged them all. The numbers came with the pack and I have sponged them all with Desert Sand ink and then using Liquid Glass adhered them to the front of the little boxes. The Christmas tree has been cut in 3 sizes from the Artbooking Cricut cartridge in the green paper from the Yuletide Carol paper pack, and I have adhered them with foam tape to try and create some dimension. The boxes have been made from the Artiste cartridge and I have tied them up with the metallic bakers twine. The Santa is from the Yuletide Carol Complements that I have stuck onto some White Colonial cardstock and cut out. I used tabs of Colonial White cardstock to adhere to the box. The Merry Christmas is from the Artiste cartridge. Here is another kitset this time featuring a bird on a cage. I have sponged the entire cage with Desert Sand ink and the edges of the bird before mod podging the sorbet coloured paper from the Seaside paper pack. The paper went really well with some paper flowers that I had purchased last year in a special bundle from CTMH. The large flower has been cut using Art Philospohy using the pattern from Cathy Derouche (https://www.youtube.com/watch?v=tzs8Sc-BLO4) out of Sorbet cardstock and the edges have been sponged with Sorbet ink. The paper flowers all coordinated so well with various shades of sorbet to a deep pink with different shapes. I have cut the leaves from Art Philosophy in Olive cardstock and inked with New England Ivy ink and then I have shaped then before placing them on the cage. The smaller leaves are from the paper flower packet. I have finished off with some bling with clear sparkles and the clear sparkle flourishes.